The Coal Rotary kiln has advantages of reasonable structure, high efficiency, low energy consumption and convenient for transportation with convenient and reliable operation. Therefore, the consumption of the coal and the Coality is lower than the common ones while the production capacity is more than 10-15%. Coal Rotary kiln is composed of cylinder, gears, support device, kiln liner and kiln tail sealing equipment,kiln head hood and fuel device. As a heated pivoting part, cylinder is made up of high quality carbon steel plate and support device supported by wheel belt. There is mechanical or hydraulic pressure catch wheel on the first or several support devices in order to control the turning of cylinder. Gears make cylinder rotate according to process required by rotating speed through the ring gear in the middle of cylinder. Due to installation or maintenance, the bigger rotary kiln has auxiliary rotary gears, which makes cylinder gyrate more slowly. To prevent enter of cold air and dust overflow, the reliable kiln tail and head sealing equipment are installed on feed and discharge end. 1. Coal rotary Kiln can reduce materials’ moisture content from 65% to below 13% with high drying ratio. 2. Coal rotary Kiln doesn’t decompose materials while drying the materials. 3. 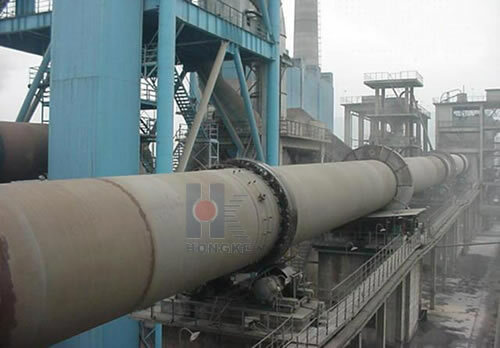 Coal rotary Kiln has a high degree of mechanization, large processing capacity, continuous operation, low malfunction, low maintenance cost, low power consumption and so on. 4. As there are lifting plates inside it, eclectic rotary Kiln can dry materials uniformly. In addition, when Coal rotary kiln is drying the materials, it also can achieve the purpose of sterilization and deodorization. Small Rotary kiln is a Thermal Equipment which is used for heating materials, like cement, copper Metallurgy, ferrous metallurgy, refractory material, chemical materials, paper making etc. The Coal rotary kiln is a cylinder that is slightly inclined and slowly rotated about its axis. 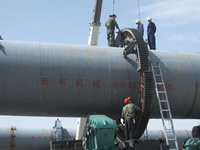 The materials, which are fed into the upper end of the cylinder, gradually move down towards the lower end and may be stirred and mixed as the kiln rotates. Hot gases may be generated in a furnace outside or by an internal flame pass along the kiln (usually in the opposite direction) to raise the materials to a high temperature.